Falcinellus cyanomelas Vieillot, 1819, Orange River, northwestern Cape, South Africa. 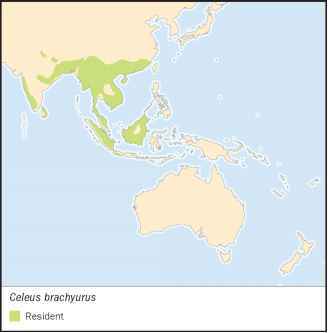 Two subspecies. English: Scimitar-billed woodhoopoe, greater/black scimitar-bill; French: Irrisor namaquois; German: Sichelhopf; Spanish: Abubilla-arbórea Cimitarra. 10-12 in (26-30 cm), 0.8-1.3 oz (24-38 g). Small, plumage black with purple gloss and white spots on primaries and tips of outer tail feathers. Black bill and feet, strongly decurved bill slightly larger in male. Southeast and southern Africa. 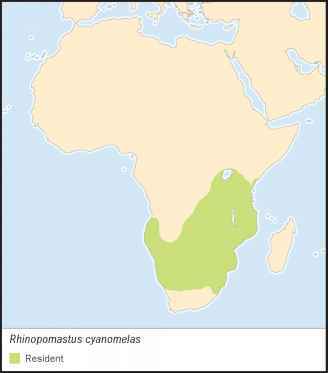 R. c. schalowi: southern Uganda, southwest and central Kenya and southern Somalia south to Zambia, and northeast South Africa; R. c. cyanomelas: southwest Angola and Namibia, east to northern South Africa. Open woodland, savanna, and dry thorn-scrub with a few larger trees, to over 6,560 ft (2,000 m) above sea level. Solitary, in pairs, or in family groups after breeding,. Roosts in tree hole or, if unavailable, clings to trunk. Territorial call a mournful three to five hooting notes. Mainly insect larvae and spiders, plus some other small insects, fruit, buds, and nectar, taken among finer branches and twigs. Probe at all angles, often inserting only the slender lower mandible. Join mixed species foraging flocks during dry winter months. Breed as territorial pair. Nest in tree hole, usually during early summer wet season. Lay two to four eggs, white or slightly-tinted in color, incubation 17-18 days, female and chicks fed at nest by male, nestling period about 24 days during which female emerges to help male. Chicks produce smelly preen oils and feces in defense. Not threatened. Widespread and common throughout its range, including in a number of large national parks.